This post has 2,893 views. There is a first time for everything, and unfortunately I got into my first car accident a week or two ago. 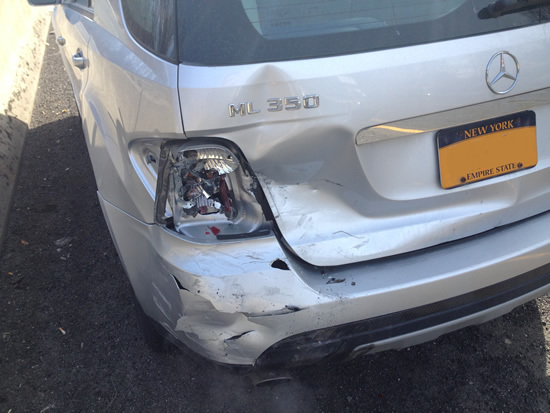 My car got rear-ended by another SUV, and it was a little more than a fender-bender as you can see in the photo. Fortunately nobody was injured, and I was able to drive away from the incident. My ML-350 took a pretty good hit in the back, but the fact that I was able to drive it for quite some distance to go home shows that these German cars are definitely built solid. I took my car to the shop, and it’ll probably be there for a while since the bumper, real left tail lights and the whole tail gate near to be replaced. It was good that I wasn’t liable for the accident. I was fortunate this time, and I’ll certainly strive to be a safer driver. Hopefully I’ll get my car back soon. My car was rear-ended and it got a fair bit of damage. On a lighter note, this week was my university’s spring break. I’m still busy with preparing my dissertation and trying to find a job, but I did find a day to go skiing with some friends. We headed to a mountain in the Green Mountains of Vermont for a fun day of skiing. Even though I haven’t skied in a year, I did pretty well and only really fell once during the whole day. That ski hill was nice in that most of the trails were pretty wide, so there was room to turn. We also went on a weekday so the place wasn’t crowded, and the weather was great for skiing: not too cold or too warm, and mostly sunny. I had hoped to go to another bigger ski hill during the week, but things didn’t work out. Still, being able to go skiing once was a nice break from work. Now that spring break is coming to an end, I’ll have to work hard to make sure I graduate, and also find a job to boot.